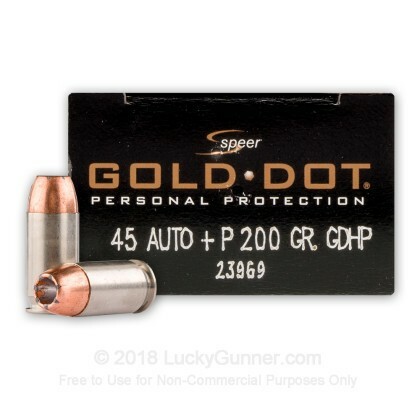 Speer Gold Dot ammunition is the leading brand of self-defense ammunition used by police officers in the United States. And no wonder: it's reliable, accurate, and effective. 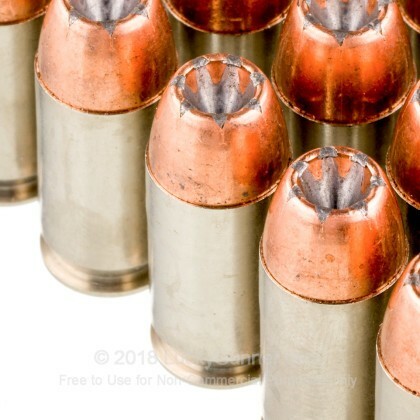 Gold Dot bullets are composed of a lead core with a hollow point shaped along "memory lines" that facilitate the projectile's expansion upon contact with an assailant. The bullet's jacket is molecularly bonded for optimal weight retention and will not separate from the core as it expands. 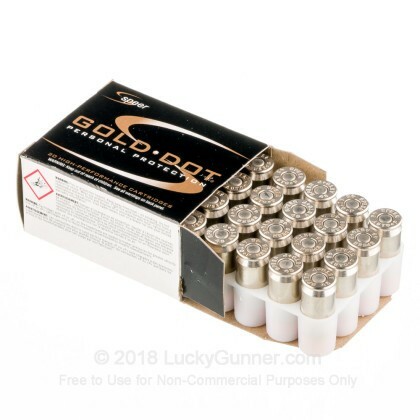 Each .45 ACP cartridge in this box of 20 fires a 200 grain projectile at a muzzle velocity of 1,080 feet per second. 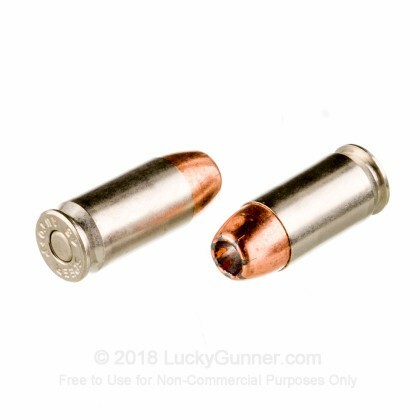 This combination of a medium weight bullet fired at a high velocity results in excellent terminal performance at the cost of significant but manageable recoil--a downside minimized if your weapon of choice is a full-size pistol such as a 1911 or a SIG P220. Speer is a division of Vista Outdoor, a group that also includes Federal, Bushnell, Millett, and many other top shooting brands. Like other members of this group, Idaho-based Speer maintains its own headquarters and production facility. 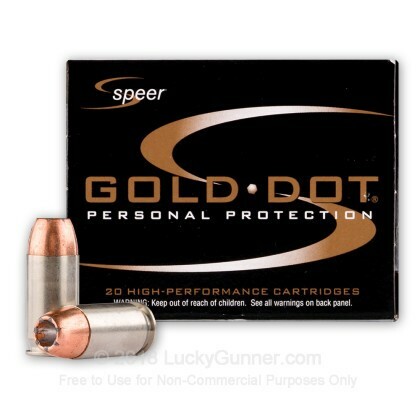 Speer ammo uses non-corrosive Boxer primers and brass cases. 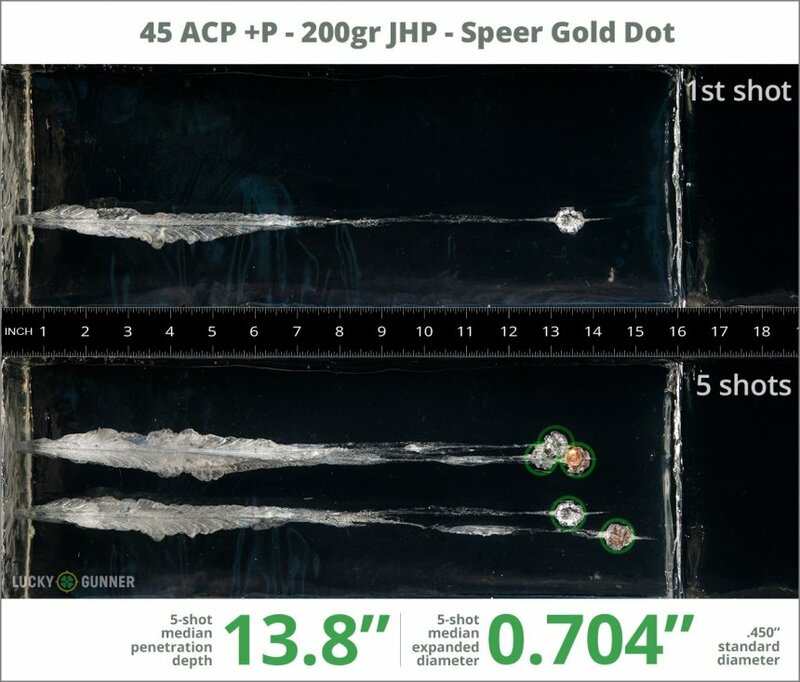 We test fired five rounds of .45 ACP (Auto) Speer 200 gr Gold Dot +P into synthetic ballistic gelatin to observe its expansion and penetration characteristics. The ammo was fired from a Kahr CW45 pistol at a distance of 10 feet. A four-layer barrier of heavy fabric was placed in front of the gelatin to simulate clothing. 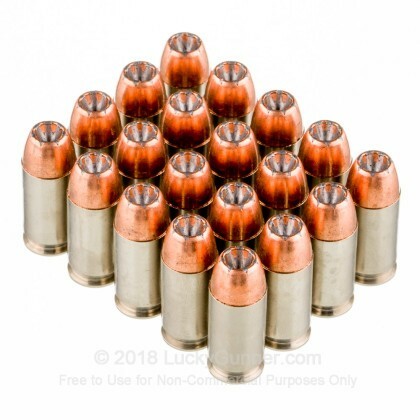 1.04" This ammo: 0.70" Min: 0.45" Median: 0.64" Max: 1.04"